Pasta bolognese has always been one of my favorite meals, and it's one of two things I always want to eat on my birthday, that's how much I like it! It takes a little planning though, so I don't often get a chance to make it since during the week I'm more of a "what's in the fridge/cabinet that can be done in half an hour or less?" kinda cook. Shawn and I stopped buying beef about a year ago - we've replaced it with ground turkey breast and we also eat a lot of pork, mostly in sausage form. We'll still eat the occasional hamburger when we're out and about, but for the most part, red meat is pretty much entirely out of our diet. I used to pick on turkey because I thought it was flavorless, which, well... it is. But that means you get to flavor it any way you want! It's like the tofu of meats. Ew, that doesn't sound good... but if you eat tofu, you know what I mean. 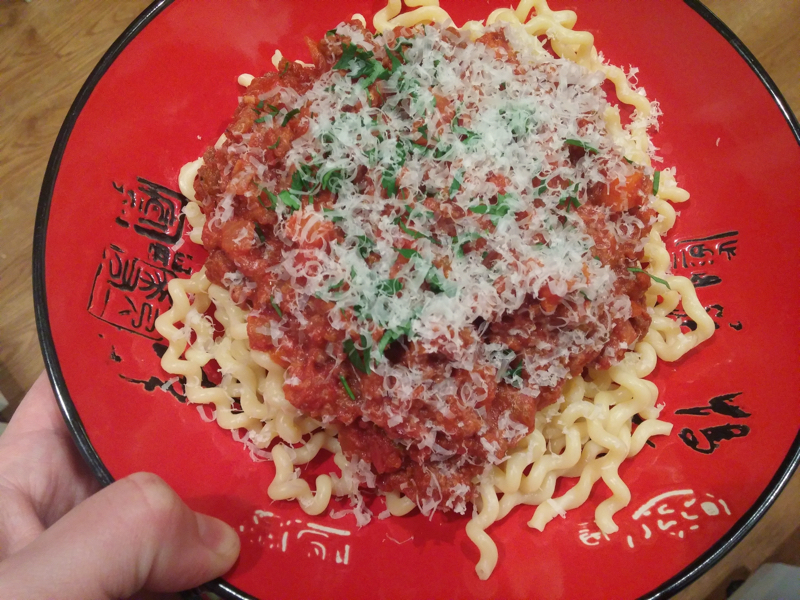 Anyways, here's a recipe for a somewhat "healthier" bolognese that I made a while back when I was in a pinch. I knew I wanted to make bolognese, but I only had ground turkey in the fridge. So I picked up a few sausages and cut the casings off to add a little fat to the dish. And it was delicious! We also usually eat brown rice pasta or quinoa pasta, but I splurged on some fancy noodles for this dish. I mean, come on, it's bolognese! You can take away the beef, but don't fuss with those noodles! - Heat a little olive oil in a large pan over medium heat and cook the onion, carrots, celery, and garlic until the onions soften and are almost translucent. - Add the ground turkey and sausage and cook until no pink remains. - When your sauce is almost done, boil a pot of water for the pasta. 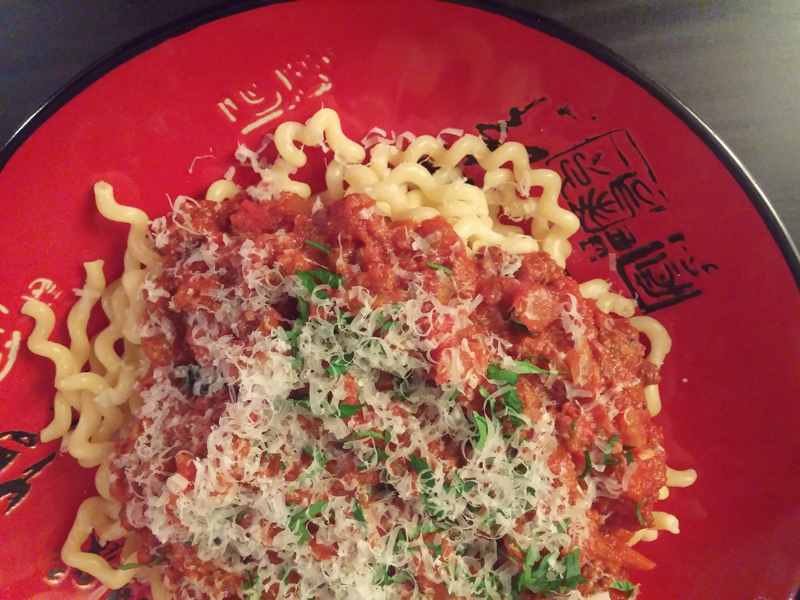 To plate, spoon pasta into a bowl, spoon bolognese sauce over pasta, and top it off with freshly grated pecorino or parmesan and fresh parsley.